A chair as clever as it is stylish; the Zipline Convertible Sleeper Chair with Ottoman is a fun and functional centerpiece for any room. With its 3-tiered multifunctional design, it creates the perfect layout for your space with the ability to customize it quickly and easily. 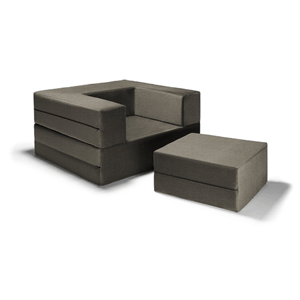 Lounge in its chair form and use the accompanying ottoman to put your feet up. Or, stack the ottoman inside the chair to play cards or use it as a spacious barstool. Even better, fold it out completely and get some sleep on the twin-size mattress. The soft and durable covers are both removable and machine-washable. Care Instructions for Cover: machine-wash with cold water, tumble-dry on low heat.